The V&A collections were originally intended to inform and inspire ‘designers and manufacturers’, but this radical purpose has been obscured over time. 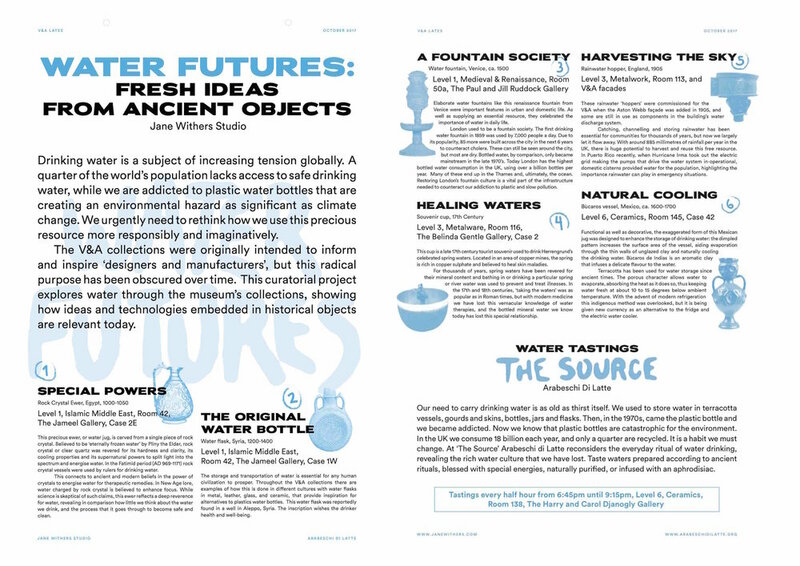 For the water-based Friday Late, we curated and presented a tour exploring water through the museum’s collections, showing how ideas and technologies embedded in historical objects are relevant today. The tour took visitors around collection items throughout the museum such as an Egyptian rock crystal ewer, terracotta vessels, and water fountains, highlighting the ways in which we might apply historic ideas to our contemporary lives in order reconsider our relationship to water, and rethink the use of single-use plastic. The tour concluded with a water tasting by Arabeschi di Latte at ‘The Source’, reconsidering the everyday ritual of water drinking, and revealing the rich water culture that we have lost. Waters available to taste were prepared according to ancient rituals, blessed with special energies, naturally purified, or infused with an aphrodisiac.